Astro Zombies - unhappyends Jimdo-Page! 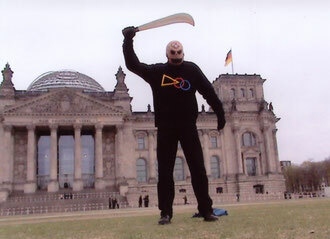 This week Ted V Mikles production part 5 of his ASTRO ZOMBIES franchise was shot in Berlin near Reichstag and Brandenburger Tor. Joerg Moehring who played one of the Zombies invited me to come to the set. Martin Schmidt directed and shot several scenes with lots of people slaugthered by and running away from the uncanny visitiors from outerspace. To learn more about Ted V Mikles wonderful and crazy series just have a look at his great website.